I haven't seen the new Gatsby yet, but not for lack of desire. It has just been such a busy summer so far. I will admit that I worry that I will be comparing it to the Robert Redford-Mia Farrow version I fell in love with back in high school. I'll add that I am aware that it does bear the ear-markings of the seventies when I see it now. I've already heard that there's an undercurrent of rap in the new movie, which will probably trouble me. When it gets right down to it, though, I'm more likely to say what I always say: the book is better. Meanwhile, I have been getting my Fitzgerald fix while on the road this past week reading Therese Anne Fowler's new novel Z: A Novel of Zelda Fitzgerald. Several years ago, at our state English conference, we had an actor who performed a one-woman show about Zelda. We might have expected lots of jazz and the Charleston, but she portrayed the dark side too, intimating that Scott mined Zelda's writing--her letters, her journals, even her stories--and took them as his own. That detail of her fiery death at a mental institution here in North Carolina put a bit of a damper on her life story too. 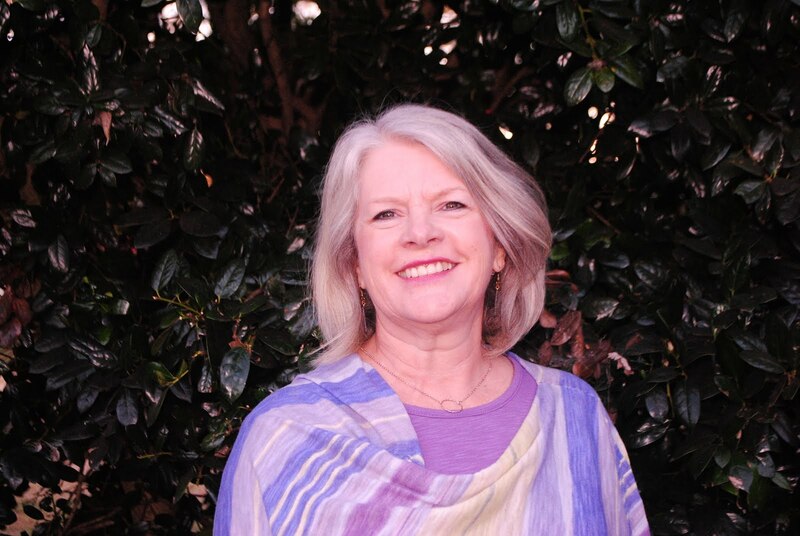 Fowler's novel is told from Zelda's point of view, relating her life from the time she met Scott when he was stationed in her home, Montgomery, Alabama, when she was a headstrong seventeen-year-old girl from a prominent family. The story she tells shows the impact of the alcohol-fueled lifestyle of the literary and artistic bright stars of their time, which Fitzgerald (or Stein) called "The Jazz Age." While Scott is portrayed as a talented but flawed man who was as concerned about his literary reputation as most prominent politicians are concerned about their legacy today. He comes across as jealous, petty, and manipulative. Zelda is a talented woman discouraged or prevented from exploring her own talents, eventually destroying her physical and mental health. Having read Paris Wife, the story of Hemingway's first wife, I was especially intrigued by the story of Hadley and Hemingway at this juncture in their failing--and then failed--marriage. The name-dropping of the circles in which they moved, first in New York, then in Paris and other parts of Europe, is particularly amazing because it is true--Cole Porter, Mencken, Picasso, just about everyone who was making a mark in the cultural world between the two world wars. In her afterword (where she mentions having written part of the book during writing residencies at the Weymouth Center for the Arts in Southern Pines), Fowler admits that her research was sometimes split between "Team Scott" and "Team Zelda." I'm glad that Zelda got her say this time. 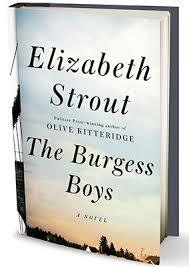 Elizabeth Strout's new novel The Burgess Boys had at least three strong points in its favor as I started selecting my next summer read: First, I had read Olive Kitteridge (before it won the Pulitzer Prize) and loved it--loved Olive, in fact. Second, my mother was a Burgess. I know. That's not the best reason in the world to pick a book. Third, I came across a signed copy at Ann Patchett's Parnassus Books in Nashville. Then I found out my sister Amy was reading it, too, so I was ready to head right into it, knowing I'd have someone who'd discuss it with me. Strout has a knack for writing about flawed characters with far-from-perfect families in such a way that readers can't help but care for them. In this novel, the Burgess boys are two grown brothers living in New York City, one more successful--at least on the surface--personally and professionally, who learn that their sister's teenage son Zach, living in their small Maine hometown Shirley Falls, has thrown a pig head through the door of the local Muslim temple. Readers learn that the boy is a socially awkward boy who acted less in malice that for attention. The publicity given the case nationwide--particularly because of the influx of Somali refugees to the small town--is pressuring local, state, and even federal officials to consider pressing charges for a hate crime. Running alongside the boy's plight, however, the narrative observes the complicated family dynamics among the three siblings and their families. Jim, the more successful lawyer, has always seemed the more charasmatic of the three. Bob's marriage has failed, and he lives in an apartment his brother ridicules. Strout reveals that Bob has had to live with responsibility for an accident that killed their father when he was very young. His mother, rather than blaming him, had seemed to favor him. The tensions come to a head as the two brothers deal with their nephew and sister's legal plight and their own relationship. If Tolstoy is right about happy and unhappy families, it may also be true that as readers we are drawn to other families' problems, enjoying our status as observer as we watch them face trouble and conflict, then fight, think, or talk their way out of it. Labels: books; reading; Elizabeth Strout; The Burgess Boys; Parnassus Books; Ann Patchett. I hadn't gotten far into the book before I knew it was one I'd suggest to several of my reading friends. As the story opens, Harold Fry, a 65-year-old retiree, receives a letter from Queenie Hennessey, a woman with whom he worked many years ago, letting him know she is in hospice care with terminal cancer. Harold struggles with what to write her in response, then walks out to mail the letter--and he just keeps walking. After meeting a young woman in a gas station (to whom he refers as the "garage girl") he decides he is going to walk all the way (500 miles at least) to visit her to save her. He eventually calls his wife to let her know his plans. The back story follows Fry's relationship with his wife (now cool at best) and his estranged relationship with his son David. As he walks, wearing his yachting shoes the whole way, he meets a variety of interesting characters and recognizes the innate kindness of most humans. His wife, in his absence, realizes she actually misses him and begins to recognize her own responsibility for the deterioration of their marriage. I got so caught up in the book and cared so much about the characters that I felt the blisters on poor old Harold's feet. I also felt such irritation at the self-seeking crowd that joined him on his pilgrimage once he received some unwanted publicity. I was glad, too, that his wife didn't have to end up as the antagonist in the book, but became a sympathetic character herself. 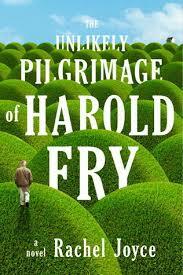 I loved the quaint travelogue feel of the book, and I grew to love the sweet, flawed man Harold Fry. Once again, as my summer vacation begins, I am looking forward to guiltless reading time. I have my stack (literal and figurative) of books I hope to enjoy this summer, but I know that all kinds of things happen to reshape the list. For now, I am working on The Unlikely Pilgrimage of Harold Fry by Rachel Joyce and The Burgess Boys by Elizabeth Strout. I'm also looking forward to Z: A Novel of Zelda Fitzgerald by Therese Ann Fowler and maybe even a re-read of The Great Gatsby since the movie's coming out. I also have my eye on Kent Haruff's Benediction, since I loved Plainsong and Eventide so much. In the meantime, though, I plan to catch up on reviews of several good reads I've enjoyed lately--not necessarily in the order in which I read them. 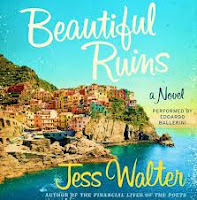 One I must mention is Beautiful Ruins by Jess Walter. This book popped up on my reading radar, and I'm glad I read it. The story takes place back and forth between 1962, when Elizabeth Taylor and Richard Burton were filming Cleopatra and beginning their on again, off again romance that led to more than one marriage. The main characters, though, are Pasquale, a young Italian man who has inherited the family business, The Adequate View Hotel, in a sparsely populated, practically inaccessible location, and Dee Moray, a young actress who arrives by boat believing she's suffering from stomach cancer. Their stories intertwine with a number of characters, Michael Deane, a big Hollywood figure about to venture into reality television, his discouraged assistant, a writer down on his luck ready to pitch a script based on the Donner party, and the son born to Dee after leaving Italy. The novel is built on layers of stories--the characters' individual stories, the movie script, even the one chapter written by Alvis Bender, an American who comes to Pasquale's hotel each year to write--only working and reworking the single chapter. A real bonus, though, is the material after the novel, including an interview with the author about how he wrote the novel and his own explanation of the long process (fifteen years) of writing this novel. Walters' notes on the novel provide many valuable lessons for writers wanting to home the craft. In fact, this novel is one I would suggest to my own students to "read like writers." Stay tuned this week for the next in my "catching up" series. With one exam day left (Monday) and grades due by noon Tuesday, I am working to keep my head above water (supply any of the cliche metaphors--light at the end of the tunnel, etc.). I realize that I have quite a few books to review, so I'll start Tuesday or Wednesday playing catch up. Today I am going a different direction here. In the past few months, I have lost three former teachers that were mentors and friends to me. Flora Hopper was my fifth and sixth grade teacher, after she retired from teaching high school Latin. I'm not sure what prompted the move. She told me in one of the many letters we exchanged after I became a teacher myself and thought to thank her for her influence, that she sat down with her husband every night after supper to learn just enough of the "New Math" in vogue that year that she could teach us. I remember so many things I learned in her class (none of it new math, by the way). We began each day with the pledge of allegiance first in English then in Latin (Videm meam obligo vexillo....). My poem "Verbum Sapiente Sat Est" is about her too. I remember that she gave us the freedom to be creative and collaborative long before either was academically fashionable. Axel Wilhelm Swang was the Business Department Chair at Lipscomb during my tenure there as an accounting major. I remember so many of his jokes that reinforced what he was teaching. I know the number he had to forget in basic training. I'll never forget his wedding anniversary (Halloween). I know the correct answer was often "It depends." I remember that the person with the class number 13 would be called on more often than anyone else. In the years after graduation, my husband and I often visited Dr. Swang and his wife. They held the department Homecoming tea at their home until the school made other plans. (Note that Homecoming has just about dwindled away from former graduates since then.) His warmth when we returned meant so much to us. I don't know if I can ride past his home on Tyne Blvd. without a twinge of sorrow and nostalgia. The accounting degree didn't take with me, but I learned so many life lessons from him. Dr. Bill Foster influenced me more than I can begin to describe. While Mrs. Hopper and Dr. Swang lived to a ripe old age, Dr. Foster was much to young to go (in my humble opinion.) He served as English department chair when I returned for my real career, and he ended up hiring me as an adjunct faculty member after I graduated, as I took one more class to get in my 18 hours. I took him for every class I could--linguistics, folklore, grammar. I missed out on his Shakespeare class, and even though I had a great professor, I know I missed something special there too. I never could call him Bill, even when we worked together. I saw him last when I happened to be in town when the UNA storytelling festival was held. I was thrilled to see one of my favorites, Donald Davis. In the weeks that followed, I got a (handwritten) note from Dr. Foster, who had attended the funeral service for Alabama's best-known storyteller, Kathryn Windham Tucker, officiated by Davis. This week, I responded to an unusual request from a poet friend on facebook. She needed someone to diagram an 84-word sentence, cast in legalese. It took me a couple of days, and the final draft took three long sheet of paper. I had learned from the best. In Dr. Foster's class, if I remember correctly, our final exam was a Faulkner sentence. I wish I had the chance to tell him I am still using what I learned from him-- every day. Labels: grammar; Dr. Bill Foster; Dr. Axel Swang; Flora Hopper; storytelling; grammar; diagramming sentences.